The Compensation is entered in the Compensation Code fields of BB (Buyer's Broker), SU (SubAgent), and/or TR (Transaction Coordinator). Percentage (P): The first digit being the full percentage point and the second digit being the partial percentage (no decimal is used). The "P" represents percent. Dollar (D): If a set dollar figure is offered instead of percentage, use the "D" to represent the dollar figure being offered as commission. Bonus information may be placed in "Other" field. The Microsoft® Internet Explorer®, Google Chrome®, Mozilla Firefox®, and Apple® Safari® browsers supported by the MLS all include built-in spell check features. To eliminate potential errors or conflicts with these browser-based spell check functions, the Rapattoni Spell Check icon was removed from the MLS the night of Wednesday, February 26, 2014. Users can configure their browser-based spell check settings by following the steps listed below for the applicable browser. Please note: To find suggested spellings, right-click on any red underlined misspelled word. 3. Under Spelling Correction, "Enable spelling correction"
Please note: This spell check feature is a function of the Windows® 8 operating system and not Internet Explorer®. Google Chrome® users can also allow Google’s web services spell checking technology to automatically check your spelling in web forms and text fields. To enable this feature, right-click inside the text field that you’re typing in and select Spell checker options > Ask Google for suggestions. By default, Firefox is configured to automatically check spelling. You can turn it off or on in the Options window. By default, Safari® is configured to automatically check spelling. Apple® users can turn it off or on by control-clicking in any text field on a web page accessed in Safari®. Windows® users should right-click in any text field. Go to the Listing Detail page for the Listing you want to post. Please note that only the Listing Agent can post links to Twitter and Facebook from the MLS. Click the icon to post the listing to Twitter®. Click the icon to post the listing to your personal Facebook® wall, or click the icon to send the listing to another Facebook® user or group via private message. A new page will open. If you are already logged onto Twitter® or Facebook® on your computer, it will take you directly to the post editor. If you are not logged in, it will ask for your credentials. The public link for the listing, as well as a description as determined by your MLS, will be entered in the post editor. You can change the information you wish you include in your post manually, if desired. Please Note: Due to conditions on the part of Facebook®, users cannot post listings to a business page. Open house information can be entered in the MLS and seen by agents and the public. From the Listings menu, choose View/Revise Your Listings. Next to the desired listing number, click the Revise icon . 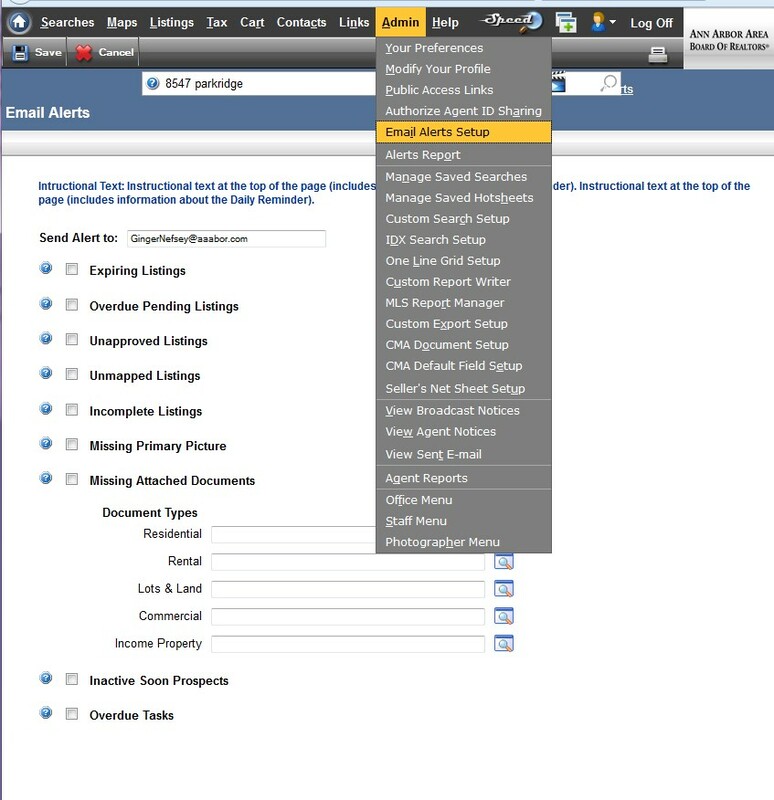 In the Revise Listing menu, under Listing Information, click Open House Dates. Enter the appropriate information and click the Savebutton in the MLS toolbar. NOTE: The Open Houses button that is available to the public displays open houses scheduled within the next two weeks. Set up automatic email notifications for expiring listings, overdue pending listings, unapproved listings, incomplete listings, missing primary picture, missing attached docs, inactive soon prospects and overdue tasks. 1. Click "Admin" on the top menu bar. 2. Click "Email Alert Setup"
3. Choose the email you would like alert sent to. 4. Choose alerts you would like notifications for.